Cadets and Officers from the South Australia Wing of the Australian Air League were recently granted a special privilege with a visit to the RAAF Base Edinburgh on 9th July 2015. Their guide was Major Genevieve Ruger, an Australian Army Black Hawk pilot, who lead a tour of the Aircraft Research and Development Unit (ARDU) where cadets saw an F-111, twin seat F/A-18 and a number of PC9/A trainerss. The F-111 was a unique aircraft – “A8-132” was operated by ARDU for many years as a research and development aircraft. The next stop was the Aircraft Life Support section where safety equipment for aircrew is maintained. Cadets saw parachutes being packed, dinghies being tests as well as helmets and oxygen systems. Two lucky cadets, Armand Ottermann and Ben Welham even got to try on the helmets worn by P-3 aircrew. The final part of the visit was a tour of the No. 10 Squadron maintenance hangar with displays of a T-56 engine, Harpoon Missile and Torpedo. 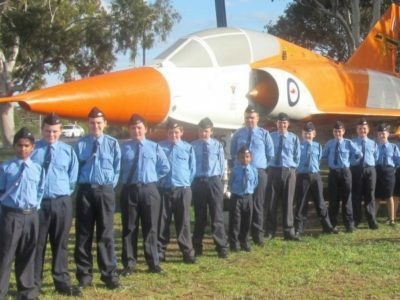 In a real surprise for the cadets, the two RAAF technicians who led the tour of 10SQN – LAC Steve Domagalski and LAC Chris King were both former members of Parafield Squadron. Both technicians were keen to meet the cadets and were very interesting as they also told the cadets how they had joined the RAAF and how much they were enjoying their careers. The visit concluded with a photo opportunity with the Gate Guardian at the RAAF Base, a very rare twin seat Mirage III A3-113. On departing the RAAF Base, the cadets thanked their escorting officer, Squadron Leader Carter, who complimented them on their behaviour, excellent questions and their appearance. The visit certainly gave the cadets a broad view of the Royal Australian Air Force.